Here’s a new series for my IC blog: the sample meal. 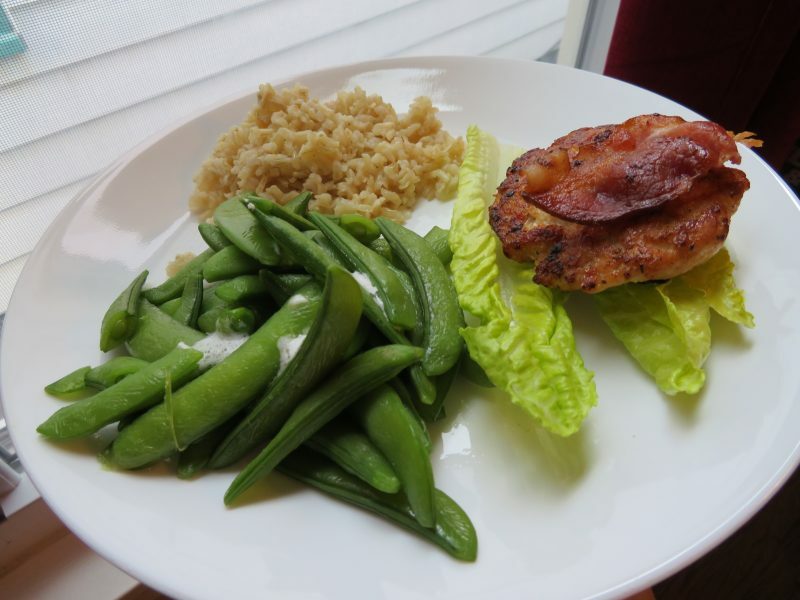 Here we have homemade, plain chicken burgers with a piece of plain bacon on top, sugar snap peas with butter, and plain brown rice that was made with safe chicken stock (without soy or other irritant ingredients), salt, and butter. Daisy pure sour cream, about 2-3 Tbsp. NOTES: * My bladder is so bad now I can’t buy ground chicken in the normal, pre-packed meat section. I looked at the ingredients of the Perdue ground chicken and it actually had vinegar in it, a known IC irritant. Are you kidding me? I had to go to Mariano’s fresh meat section and ask the worker if it was 100% plain ground chicken, and she said yes. In a perfect world, I’d add Panko crumbs to this recipe but I am not 100% if I can tolerate them yet. Preheat oven to 375*, or pre-heat your grill. Using your clean hands, mix the ground chicken, salt, Panko crumbs, and the sour cream in a bowl. Add optional finely chopped parsley to mix, if tolerated. It will be quite sticky. Form into small burger patties. Lightly push down the center of the burgers so they do not become a domed burger. If using the grill, cook until it’s safe to eat. If using the stovetop, heat pan to medium heat. Lightly spray some PAM, or drizzle some olive oil in your pan. Once pan is hot, gently place your chicken patties on the pan and brown on each side. Then finish in oven to thoroughly cook the insides, until they’re safe to eat. Allow the meat to rest, serve. This entry was posted in Entrees, I.C. Bladder Safe, Sample Meals.